One of the most personal and important aspects of your wedding planning process will be choosing your wedding party! Your wedding party (also known as the bridal party) will include not only the people who will help you plan your big day, but they also are those you will want by your side when you walk down the aisle and say your vows. Typically your wedding party is made up of your sisters, brothers, and closest friends or family members. The following will serve as a guide to share all of the duties, roles, and responsibilities that are involved for each participant of the wedding party. Jewish weddings traditionally include Chuppah Carriers. They hold the poles of the chuppah - a sacred wedding canopy which symbolizes the couple's new home. Traditionally, chuppah carriers are men, but may also be any four people the couple is close to. In some Christian weddings, young teenagers serve as Candle Lighters. They walk in the processional ahead of the mothers of the bride and groom and light the candles at the altar. The wedding party helps the couple with various wedding planning tasks such as addressing invitations, running errands, craft projects, and more. The couple may seek advice from their wedding party in order to help make important wedding decisions. 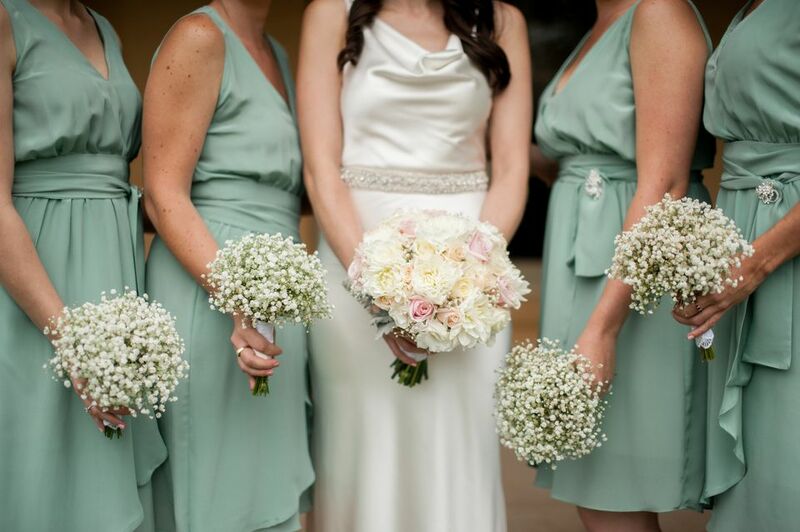 Members of the bridal party are often asked to wear certain attire (bridesmaids dresses or tuxedos) as requested by the couple to indicate their involvement in the ceremony. The wedding party helps the bride and groom get ready on the wedding day, calming their nerves and making them feel comfortable. The wedding party typically takes formal photos with the couple either before the ceremony or during the cocktail hour for the couple's wedding album. Often, the wedding party is seated at special tables at the reception, either with the newly-married couple or close by. The wedding party serves as a support system to the couple in their new marriage, encouraging their love and helping them see through arguments and fights long after the wedding day. Sometimes, the wedding party will plan special events for the couples, such as bridal showers, bachelor or bachelorette parties, or even wedding night surprises. Your wedding party is often considered to be quite involved in your wedding planning process. They will likely dedicate a notable amount of time and possibly money to participate in your day, so it's important to thank your wedding party for all their assistance throughout the process. Make sure to properly thank your wedding party for all of their hard work and to show your appreciation for their support and friendship.